My knitting recently has been driven largely by practical (and selfish) reasons. I knew I wanted a hat with a pompom and I wanted colors that were pretty neutral (my warmest winter jacket is purple, so I try to keep my knits more muted in color). I only had one skein of the blue yarn, and it was so pretty I wanted to make sure I used it for the right item. So far, this hat has gotten plenty of use. I knit this with the both yarns held at once so it would look variegated. It also was a tight knit meaning extra warmth. 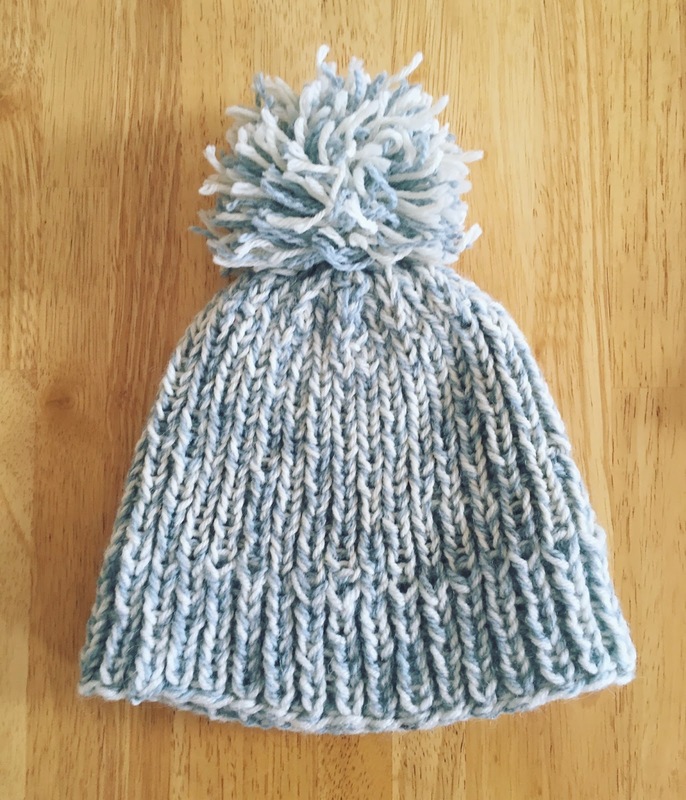 The pompom came out much better than I thought it would at the beginning. I hardly make them so every time I do, I realize I lost my cardboard cut-outs, have to scrape up some recycled cardboard, relearn exactly how it's supposed to be done, and spend way too long trimming it. I'm still not completely satisfied with it (I wish it was fuller, for one). It works for now, but I'm thinking I may just give in and buy one of the fancy 'pompom makers.' It just seems silly when it's possible to make one without it. The wool is also a bit itchy. I'm not sure if it's the fault of the Quince & Co. yarn or the unknown skein. In the future, I think I will limit myself to just soft yarn for headwear.